Shirley Anne Watson of Beauregard, Alabama was born in Columbus, Georgia to the late Anne Leona and Roy Fincher on July 25, 1935 and passed away at East Alabama Medical Center on April 9, 2019. She was 83 years old. She was a faithful Member of Providence Baptist Church. 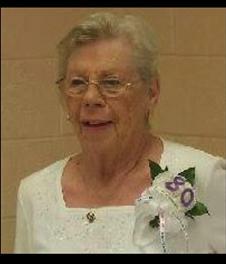 She worked in accounting as an accounts payable clerk for West Point Pepperell Company. She later worked at Diversified Products in Customer Service. Mrs. Watson and her late husband, Charles, loved to dance as long as they were able. They loved music and old movies. She was preceded in death by her husband, Charles Watson; brothers, Charles, David, and John Fincher. She is survived by her daughters, Teresa Albert (Lloyd), Felicia Kay Long (Bruce), and son, Michael Watson (Judy); grandchildren, Scott Palmer, Brandon Watson, Dennis Palmer, Adam Gilliam, Daniel Bandor, Beth Watson, Amy Orr (Tom), Jason Long (Michelle), Brandon Long, and Tiffany Long; great grandchildren, Jason, Jared, Tori, Kiley, Kinsley, Kaitlyn, Maddy, Kessa, Emma, Lillie, Libby, Abbi, and Zach; great-great grandchild, Karalyne. Visitation will be held Thursday, April 11, 2019 in the Parlor at Frederick-Dean Funeral Home from 10:00 until 10:45 a.m.
Graveside will be held Thursday, April 11, 2019 at 11:00 a.m. at Garden Hills Cemetery with Dr. Rusty Sowell officiating.